Update July 13, 2017: The frying pan in PUBG has taken its natural evolution. We know it can stop bullets. In fact, we know it can stop the bullets of 50 people shooting directly at your arse. But now the humble pan has become a true gaming icon. If fighting to live is your kinda thing, check out the best survival games on PC. The pan lets Rudeism do everything a keyboard can do, so he can run, shoot, loot, jump, and drive cars like anyone else. In fact, the pan has one advantage: hitting someone with a pan in game probably feels even more amazing. Using an attached accelerometer, the streamer can aim with motion controls and swing the pan to donk people upside the head. Hopefully one day he achieves that dream. Update July 11, 2017:It’s been a month since we discovered that frying pans are the must-wear hip accessory for every serious PUBG player. It’s only now, though, that we’re discovering its full potential. In a new video, 50 players have truly tested the pan, peppering it with sustained fire from high-powered assault rifles simultaneously. It holds up for surprisingly long, and perhaps the military should swap kevlar vests out for this. If you want to see just how much punishment it can take, check out the video above, from 2:13. Original Story June 9, 2017: How hard do you think you are? Well, whatever the answer, just know that one thing you are not harder than is a frying pan. 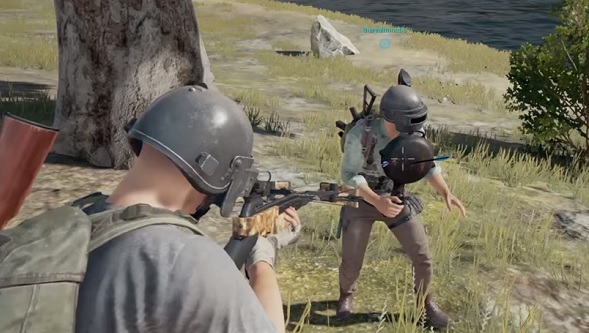 Not a regular frying pan specifically, but any of the frying pans in PlayerUnknown’s Battlegrounds.We already knew the frying pans were tough as hell due to an update issued back in April that turned frying pans into bullet shields. You can hold them up and run towards an armed opponent, and if they had bad aim and only hit the pan, you would survive. Now, YouTuber DefendTheHouse has decided to really test the imperviousness of frying pans in their latest myth-breaking video. You can watch it above, in which they test out eight different PlayerUnknown’s Battlegrounds myths to see if they’re true or not. One of them is “A pan can block infinite crossbow bolts.” They test this out by firing lots of crossbow bolts at a frying pan, discovering that, yes, this myth seems to be true. Still think you’re harder than a frying pan? Let’s see how many crossbow bolts your feeble skin can block then, eh? Only kidding, we would never do that to you – unless it’s inside a game of PlayerUnknown’s Battlegrounds, in which case, you might as well be a pin cushion. Other myths that DefendTheHouse investigates in the video include whether you can be crushed by a care package (nope! ), whether you can be revived after a long fall (yes!) or after drowning (nope!). While we’re at it, the other four myths are: Can you punch someone out of a moving vehicle? Yes. Can you shoot grenades being held by another player to blow them up? No. Can crossbow bolts penetrate through targets and get another kill? No. And can you double flip a bike? Yes, if you’re really good at steering bikes.